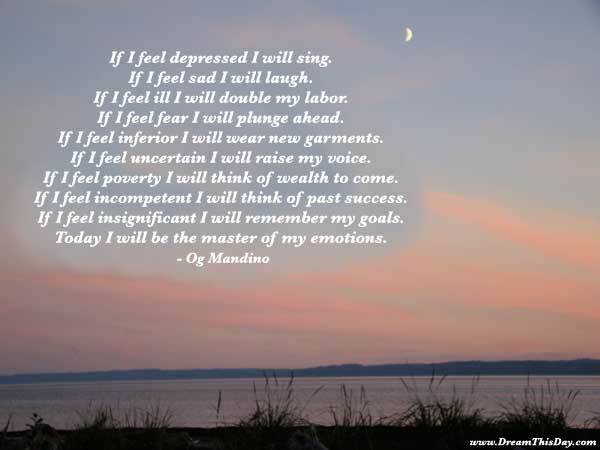 I hope you find these Quotes about Being Depressed to be helpful in overcoming depression and finding a joyful life. and of course those emotions are not restricted to publishers. then you've got a problem. One of the networks sent me a TV set to watch. I didn't care for the medium. neither depressed by failure nor seduced by applause. I usually write when I'm in a great place. When I'm depressed, I don't usually write. So I take all of when I'm depressed and throw it into when I'm feeling good. but I became even more depressed as a result. There are days when I'm completely depressed and able to do only one drawing. I'm a human being and I have my problems. with Johnny ten years ago. I would just be depressed all the time. I was not depressed when they got me out. I have always taken my dismissals as part of the game. I don't need to be depressed. It is a good lesson in covering up your feelings. No one wants to buy from someone who looks depressed. then I put on his movies and I watch them. I laugh and I cry and I have great pleasure. I guess there is nothing that will get your mind off everything like golf. but they say you get so sore at yourself you forget to hate your enemies. I kind of have a happy magnet. to get out of it as soon as possible. But I'm not like sad, depressed miserable person. I guess sometimes I give off that impression. It's much easier to write when you're sad. that angst to write from. and it's something you ride if you possibly can. between my weakness and my ambition. When we win, I'm so happy I eat a lot. When we lose, I'm so depressed, I eat a lot. When we're rained out, I'm so disappointed I eat a lot. but I don't have a game. inhaling next to an Armenian. we wouldn't live beyond 30 because we'd be so sad and depressed. You can't get real happy or real depressed when you play baseball. a lot of opportunities for atonement. Christmas is the worst of all. Holidays are terrible, worse than Sundays. we have misplaced our power. and then we are angry at being undervalued. There's a rebirth that goes on with us continuously as human beings. I don't understand, personally, how you can be bored. but I just don't understand boredom. last nugget of gold would be gone. there isn't a last nugget. you know? And the next one you're saying to yourself "God I'm in love." some of the workers were rescued. It was, you know, who was lucky and who weren't. bam, it was just, everybody was gone and it greatly depressed the state. influx of cheap and illegal labor. and my Mom would be worried about me because I would just sleep to escape. In Massachusetts, scientists have created the first human clone. Red Sox will still have not won a World Series. and we had gone to school together, were friends and everything. and he'll tell me it is no good. I've also worked hard portraying an Ireland which is fast disappearing. and I've tried to include that in the script. I worked really hard to find the heart of the book. play the game the way it's meant to be played. Don't get full of yourself if something good happens. Don't get too depressed when something bad happens. To live forever should not be an obligation. just the idea of living forever is an unbearable source of suffering. century was a poor thing. that depressed people in the Middle East held as their religion. that of course, the audience were not seeing masks moving at all. want to hide under the bed, depressed. you get your victories and defeats every day. wow, you should be so blessed. mansion and all these beautiful things. the more depressed I got. I'm too depressed to pick up my feet. you're halfway away from it. I felt we really couldn't be separated that much. while he was in the Army. It was very difficult-the phone calls and all of that. I really was very depressed. when things didn't go as I had planned. influence, but by your own consent. Thank you for visiting: Quotes about Being Depressed.